Last season the Detroit Tigers dressed several rookies. Some were planned from day one while the rest were called up due to necessity. They could almost field a full line up of their rookies from last season. This article will look at what they did at the major league level, while later articles will look at what they did at the minor league level and the contributions we can expect from them at the majors next season. Three rookies made the team out of camp but Scott Sizemore didn’t play well enough with the big club to remain the whole season and Alex Avalia platooned most of the year with veteran catcher Gerald Laird. Austin Jackson stuck the whole season as the primary centre fielder for the team. He led the team in many categories including games played, at bats, hits, triples and stolen bases. He also finished second to teammate and American League MVP candidate Miguel Cabrera in runs scored and total bases. Brennan Boesch was called up in April because of an injury to Carlos Guillen. He arrived on fire winning the rookie of the month award for May and June. When he finally had enough at bats to qualify for the batting title he was hitting in the .340’s, third in the league. He eventually cooled down, but he did finish the year with the big league club, spending most of the season there. He also ended up 3rd in home runs with 14 and third in RBI’s with 67. Alex Availia didn’t see as much time on the field as the other two rookies already mentioned, but he did appear in more games then veteran catcher Gerald Laird. His defense behind the plate hasn’t been horrible, especially considering he only started catching in his last year of college. He also threw out 32% of runners trying to steal, which would have been the highest among starting catchers. His hitting was a little dissappointing compared to the small taste we saw of him in 2009, but he did show good plate discipline. In addition, down the stretch when given the majority of the starts he seemed to thrive with the additional playing time. In the month of September he batted .302 as the everyday catcher. There is a large drop off in playing time after those three, they all saw quite a bit of playing time down the stretch due to several injuries to regular players like Brandon Inge, Carlos Guillen and Magglio Ordonez. These injuries brought us a look at Casper Wells, Danny Worth and Will Rhymes as well as another brief look at Scott Sizemore. With Placido Polanco signing in Philadelphia Sizemore was slotted before the season started to be the second baseman. The tigers had no other options really challenging for the spot either, so the position was basically given to him. This was a lot of pressure to put on him, especially considering he missed the beginning of spring training recovering from a fractured ankle. 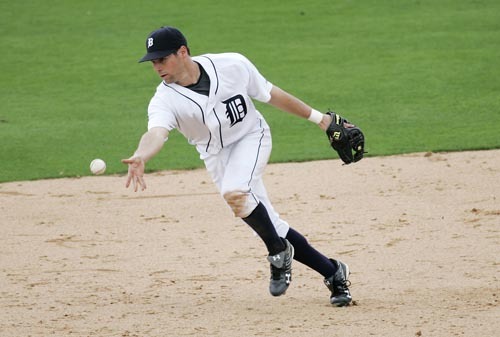 He struggled out the gate, and with Boesch’s emergence the Tigers needed to find somewhere for Carlos Guillen, which ended up being Sizemore’s second base. 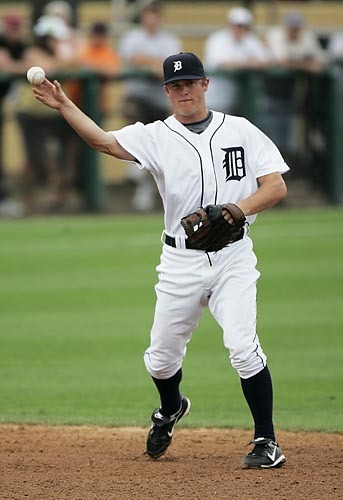 In his shorter stint with the tigers later in the season he had less pressure on him and performed a little better. He showed a little power in September with 2 home runs while batting .400, although the other 2 plus months we saw him he batted right around .200 with just one home run. The injuries to Carlos Guillen continued through the year and prompted the Tigers to give Will Rhymes his shot at second base in July. The original call up was a short stint but Rhymes returned towards the end of August and remained the rest of the season. Rhymes showed a lot of promise at the plate batting .304 in 54 games. He hit his first home run near the end of September and didn’t hit any others. As it stands right now it looks like Rhymes has the best chance to make the team as the second baseman unless any other options arise. Danny Worth got his call in May and the start to his Major League career was strong, hitting .333 in his first 8 games. He showed versatility filling in at 3b SS and 2b. His average fell after the first 8 games. He had 2 home runs with only 8 RBI’s in his 39 games stint. He hit .255 in 106 at bats and will still retain his rookie status if he plays with the big club next season. Finally we have Casper Wells. He had the shortest look of the group mentioned and other then Boesch, Avalia and Jackson he showed the most promise. He only appeared in 36 games and had 93 at bats, but batted .323 with 4 home runs and 17 RBIs. He plays solid defense as well and saw time at all three outfield positions. He has plenty of power and could see a platoon role with the big club coming out of spring.